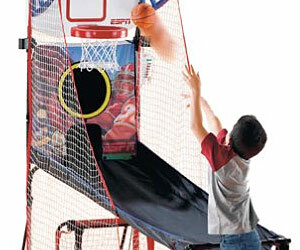 Six-in-one indoor game center lets kids play 21 electronic, arcade-style games featuring baseball, basketball, football, hockey, golf, and soccer. It includes two footballs, two basketballs and two baseballs as well as a golf ball, soccer ball, hockey puck, golf putter and hockey stick. Sound effects as well as commentary featuring ESPN Sports Center anchor Stuart Scott, and ESPN music build the ultimate game experience.